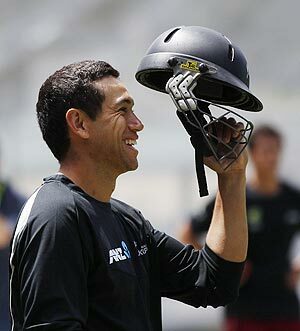 Former captain Ross Taylor has returned to the New Zealand squads for this month's One-Day Internationals and Twenty20s against England. Taylor did not tour South Africa after he was dumped as captain late last year by coach Mike Hesson following the tour of Sri Lanka, an incident which prompted a credibility crisis for New Zealand Cricket. The aggressive 28-year-old right-hander has only recently returned to first class cricket for Central Districts. “Ross is a world class batsman who is a key part of this Black Caps side,” Hesson said in a statement. Otago opening batsman Hamish Rutherford, who had a strong domestic Twenty20 competition, is the only uncapped player in the squads, while all rounder Andrew Ellis returns to both after missing the South African tour with injury. “There are a couple of changes that have been forced through injury but essentially we want to be seen to provide continuity from one series to the next,” chief selector Kim Littlejohn said. England begin their tour on February 4 with a Twenty20 match in Whangarei against a New Zealand XI. The first Twenty20 international is in Auckland on February 9. Twenty20 squad: Brendon McCullum (captain), Trent Boult, Ian Butler, Grant Elliott, Andrew Ellis, James Franklin, Martin Guptill, Roneel Hira, Mitchell McClenaghan, Nathan McCullum, Colin Munro, Hamish Rutherford, Ross Taylor. One-day squad: Brendon McCullum (captain), Trent Boult, Grant Elliott, Andrew Ellis, James Franklin, Martin Guptill, Mitchell McClenaghan, Nathan McCullum, Kyle Mills, Colin Munro, Ross Taylor, BJ Watling, Kane Williamson.